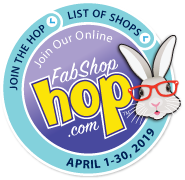 Join the FabShop Hop™ – an Online Shop Hop Register Today! Like any contest, this one has rules and some "fine print." Please read this page before registering. 1.NO PURCHASE IS NECESSARY in order to participate. 2. The following promotion is intended for viewing within U.S. and Canada only and will be construed and evaluated according to United States laws. You must be a resident within U.S. and Canada, 18 years or older, to be eligible for prizes. Our fabric and quilting friends around the world are invited to follow the FabShop Hop and Shop, but because laws differ from country to country, we cannot award prizes to residents outside of the U.S. and Canada. 3. Enter the FabShop Hop by completing online registration form -- limit one online entry per valid email address and physical address. You can register any time between now and midnight EST on February 28, 2019. 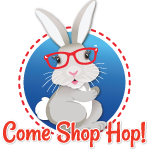 The FabShop Hop will officially start at 9:00 a.m. EST on February 1, 2019 and will end at midnight EST on February 28, 2019. Your registration gives your explicit permission to send you emails during FabShop Hops events. 4. All eligible entries will be entered in the Grand Prize, First Place Prize, Second Place Prize, and Promotional Gift Certificate, and Bonus RANDOM drawings. At each shop you must find the youfoundit bunny hidden on the site, click on it and go to the Verification Page, enter your email address, and click on Register for Prizes. This will register you at that shop and automatically send your entry to the prize database. Odds of winning depend on the number of eligible entries received between February 1-28, 2019. 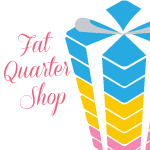 To be eligible for the Grand Prize drawing, you must register at all 73 of the participating shops on the FabShop Hop. The grand prize winner will not be eligible for any additional prizes. Anyone registered at all 73 participating shops, plus finds 10 bonus bunnies will be eligible for the Bonus Bunny random drawing. The prizes are valued at approximately $10 retail value. The winner will not be eligible for any additional prizes. Anyone registered at 70 of participating shops will be eligible for the First Prize random drawing. The prize is valued at approximately $175 retail value. The first prize winners will not be eligible for any additional prizes. Anyone registered at 65 of participating shops will be eligible for a Second Prize drawing. The prizes are valued at approximately $25 retail value. The second prize winners will not be eligible for any additional prizes. Anyone registered at 65 of participating shops will be eligible for a Promotional Gift Certificate drawing. The promotional gift certificate winners will not be eligible for any additional prizes. How Winners will be Determined: Grand Prize Winner, First Place Winners, and Second Place Winners and Bonus Prize Winners will be selected in a RANDOM drawing from among all eligible entries on approximately May 1, 2019. The prize winners will be posted on www.fabshophop.com/prizewinners_chop26.asp on approximately May 15, 2019 and will be notified by email. Winners will be notified by email. If a winner is unreachable after seven (7) days, or if that winner is unavailable for prize fulfillment, an alternate winner will be selected. If The Fabric Shop Network cannot find an eligible winner for the prize, that prize will not be awarded. The winners will be required to sign an affidavit of eligibility and release of liability and publicity (where permitted), and return same, properly executed, within 10 days of issuance of prize notification. All winners consent to the use of their name and photographs for advertising and promotional purposes. The odds of winning the Grand Prize depend on the total number of eligible entries received. The odds of winning First Place Prizes or Second Place Prizes depend on the total number of eligible entries received. 5. Eligibility: This FabShop Hop is only open to residents within U.S. and Canada who are 18 years or older (except employees and their households and immediate families of The Fabric Shop Network, Inc.). We know this isn't fair to our friends around the world, but unfortunately we can't change the laws in your country. 6. This FabShop Hop is governed by U.S. law and is subject to all federal, state, and local laws and restrictions. Void in Puerto Rico, outside the U.S. and Canada and where prohibited by law. 7. All costs, taxes, fees, and shipping expenses associated with any element of a prize are the sole responsibility of the winners. All federal, state and local taxes on prizes are the winner's responsibility. Winners will be issued a 1099 tax form for the actual retail value of any prizing exceeding $600. All prizes will be awarded. Limit one prize per person or household. 8. 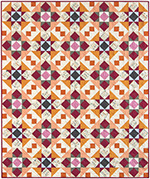 Winner's List: On or about May 15, 2019 you may obtain the names of the Grand, First, Second, Bonus Prize winners by going to www.fabshophop.com/prizewinners_chop26.asp. 9. General Information: The Fabric Shop Network, Inc. reserves the right at its sole discretion to disqualify any individual it finds to be interfering with the integrity or fairness of the FabShop Hop; or tampering with the entry process or the operation of the site; to be acting in violation of the Official Rules; or to be acting in an unsportsmanlike or disruptive manner, or with intent to annoy, abuse, threaten or harass any other person. Caution: any attempt by a participant or any other individual to deliberately damage any website or undermine the legitimate operation of the FabShop Hop is a violation of criminal and civil laws and should such an attempt be made, The Fabric Shop Network, Inc. Reserves the right to seek damages from any such participant to the fullest extent permitted by law. 10. Limitations of Liability: The Fabric Shop Network, Inc. is not responsible for any incorrect or inaccurate information, whether caused by site users or by any of the equipment or programming associated with or utilized in the FabShop Hop or by any technical or human error which may occur in the processing of submissions in this FabShop Hop. The Fabric Shop Network, Inc. assumes no responsibility for any error, omission, interruption, deletion, defect, delay in operation or transmission, communications line failure, theft or destruction or authorized access to, or alteration of, entries. 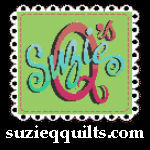 The Fabric Shop Network, Inc. is not responsible for any problems or technical malfunction of any telephone network or lines, computer online systems, servers or providers, computer equipment, software, failure of email on account of technical problems or traffic congestion on AOL or the Internet or at any site or combination thereof, including injury or damage to participants or to any other person's computer related to or resulting from participating in this FabShop Hop. 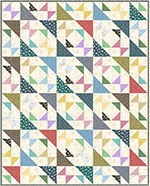 The Fabric Shop Network, Inc. is not responsible for any typographical or other errors in connection with the FabShop Hop. If, for any reason, the FabShop Hop is not capable of running as planned, including infection by computer virus, bugs, tampering, unauthorized intervention, fraud, technical failures, or any other causes beyond the control of The Fabric Shop Network, Inc. which corrupt or affect the administration, security, fairness, integrity or proper conduct of the FabShop Hop, The Fabric Shop Network, Inc. reserves the right at the sole discretion to cancel, terminate, modify or suspend this FabShop Hop. Administrator: The FabShop Hop is administered by The Fabric Shop Network, Inc.
Main Sponsor: The Fabric Shop Network, Inc., P.O. Box 820128, Vancouver, WA 98682. 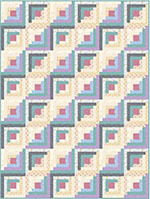 The FABRIC SHOP NETWORK, INC. is a retail organization dedicated to the promotion of independent fabric and quilt shops throughout North America and is the proud sponsor of FABSHOP HOP. Member shops have formed a network on the web to bring you the largest "virtual" fabric shopping experience in history. If you have any additional questions, please send at email to info@fabshopnet.com. The rules are subject to change without notice. The Fabric Shop Network, Inc. 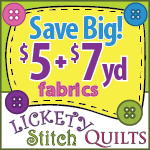 Copyright © 2000 The Fabric Shop Network, Inc. All rights reserved. Brand names, trademarks, copyrights, and service marks of products of the participating shops and suppliers are the property of those shops and suppliers.